How many times have you heard those words in your life? We hear them typically when we are going through a difficult time, whether it's sickness or a death in the family maybe. And just hearing that phrase can provide comfort, because though you already know that God knows your every care and need, and even though you may have also been praying that yourself, there is just something comforting in knowing that people care enough about you to pray those things for you as well. Because prayer is a very powerful thing. And it absolutely works. The Bible is full of instances over and over of God's people praying powerful prayers and God faithfully answering them. In 1 Thessalonians 5:17 we are told to "Pray without ceasing" because prayer is important. I have to say my favorite instance of people praying is when I haven't even asked for it. Just to have someone tell me that they have been praying for me, feels me with such love and gratitude. But what about those times when we don't pray? Let's be honest, how many times have you told someone you would pray for them and then you didn't... I know, I've been there too. You have every intention of actually praying for them, but you forget. The best cure for that is to pray even before you say that you will or right after you say it. And even better, would be to actually say a prayer over the person right then! Pray over the phone, pray in an email, actually including them in your prayer can be such a comforting moment. But what about the times, when you just don't know what to say to someone who is just in a long stretch of blah. Perhaps a few weeks ago when they first posted on Facebook about an issue they were having, you were one of the first people to comment and say, I am praying for you. And maybe you really did. But now it's 3 weeks later, a month later, 8 weeks later and they are still struggling with this issue plus another issue, plus another. It's very easy at this point to say, I'm still praying for you and let that be it. I want to say that I am not knocking prayer at all- as I've already said it is so powerful and so necessary. BUT as Christians, we need to break away from our comfortable, easy noncommittal, surface relationships and dig deeper. 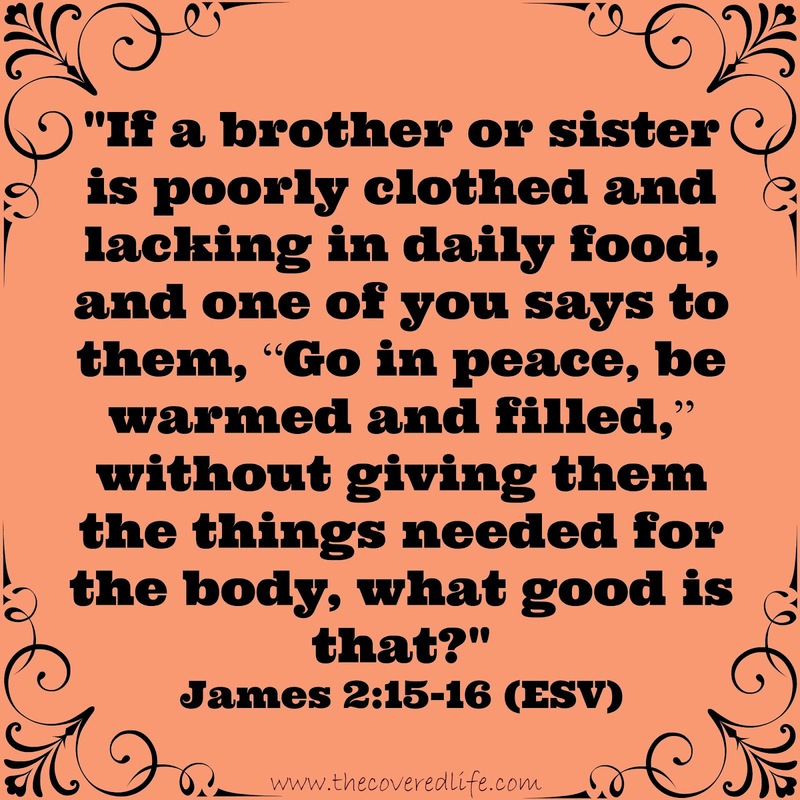 We need to be Jesus to others meaning we need to be meeting their needs. Maybe they would benefit from a nice warm meal that they don't have to cook. Or maybe they need some groceries, or money for bills, or the grass cut, or a babysitter. Or maybe they just need someone to take them for coffee or lunch and listen. Yes, they do need our prayers, but they also need our time. Next time you are about to throw out the quick, I'll pray for you, pause for a second and ask yourself if there is anything else they may be needing and then do that, too. It's not always easy to "inconvenience" ourselves for others, but people were never an inconvenience to Jesus. He stopped many times in the middle of what he was already doing to speak to someone and/or heal them. I'll admit to you that mercy and hospitality are not my spiritual gifts, but that doesn't excuse me from being the hands and feet of Jesus and giving mercy and hospitality to others. Do We Always Have To Choose Sides?